Style, innovation, and intelligence: Brendan Macdonald reviews Kandinsky’s Still Ill and discusses how the work has developed since its debut at Incoming festival. Still Ill at the New Diorama. Still Ill was initially performed by Kandinsky as a work in progress for Incoming festival. Seeing it for the first time as a developing piece, I was most impressed with the sheer inventiveness of the company. On second viewing, this time as a full-length production, it is not just the overflow of creativity that leaves an impression, but the meticulous detail with which a fully realised world is sculpted. It’s done with style, innovation, and intelligence. It’s a story about Functional Neurological Disorder, a condition in which patients experience neurological symptoms such as dystonia, seizures, and blackouts which occur without any physical explanation. Sophie (Sophie Steer) is an actor whose professional prospects look bleak when her hand inexplicably seizes up. Sophie’s acting life enriches the piece’s continuous interplay between reality and illusion. The first sequence immediately layers fiction and fact, warping both so they swirl into each other. A series of doctors – expertly caracaturised by Hamish MacDougall and Harriet Webb – learn bedside manner, repeat stock phrases, and test both Sophie’s and the audience’s reflexes. The different layers are cleverly foregrounded to be echoed later when more is at stake. What works particularly well is the acute observation that illnesses spread beyond their host. Sophie’s relationship with her brother (MacDougall) is beautifully nuanced; it’s tested more and more as her symptoms persist, and her family trauma, potentially relevant to her symptoms, suddenly is twisted into the mix as well. Steer, the only new cast member, is superb as Sophie. She colours the melodramatic soap scenes with an absurd seriousness. Elsewhere, there’s a natural ease that jars perfectly with her increasing anxiety. Both MacDougall and Webb are also brilliant, playing multiple roles with dexterity and comedic timing. It’s partially the impeccable ensemble that makes for a captivating watch. But it’s also the atmosphere. Unsettlingly underscored with music by Zac Gvirtzman, hospital noises and metallic sounds amplify moments of deep discomfort. Themes of repetition and surrogacy are interspersed throughout: little screens around the stage stand in for laptops, chopping boards, and fridges. Take after take, skype after skype, frame by frame, any critical semblance of reality begins to feel as alien as Sophie’s hand feels to her, an appendage as removed as a blue prosthetic prop. And like in phantom pain experiments, questions about what is real or really felt begin to unravel cause-based arguments or pathological diagnosis. That’s where Still Ill hits home: the play is as much about treatment as it is about illness. It not only highlights societal assumptions of creativity, worth, and soundness of mind, but it also hones in on the value we place on narratives. Although the constructed stories – such as the junior doctor doing surgery on a brain while also having a brain tumour – are often considered most dramatic and meaningful, it’s usually the more complicated, understated, and unexplained stories that lead to a prognosis. A few of the sequences could use an edit, and the epilogue, while intriguing, feels slightly underexplored and too loosely connected. 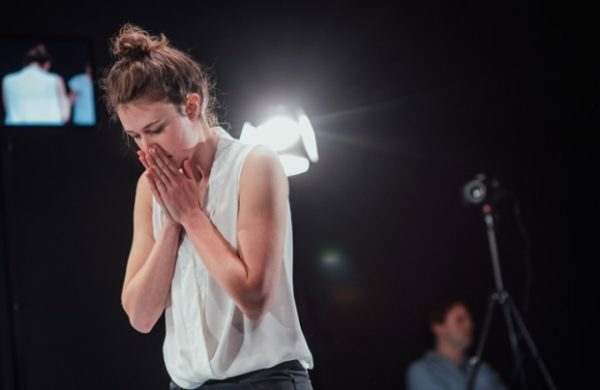 But still, brilliantly crafted, exacting, and endlessly inventive, Still Ill is a complex and meticulous journey into the world of undiagnosis, and shows that it’s the slow and somewhat boring act of coping that surprisingly provides a little hope. Still Ill is on until 19th November 2016 at the New Diorama. Click here for more details.